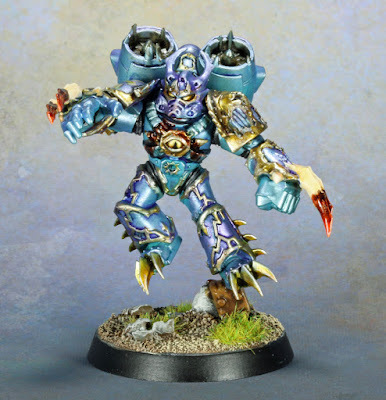 When a pack of Warp Talons emerges from the Warp, it appears to those on the battlefield below as if daemonic warriors have literally burst out from nothingness into fiery, vengeful life. Locally, a bunch of hobby shops have been closing their doors. While generally bad news, I did pick up a box of Warp Talons that were significantly marked down. I figured that these would go with my Iron Warriors. I still have a box plus a blister of the previous metal models that I was going to use as raptors and in the traditional Iron Warriors scheme. 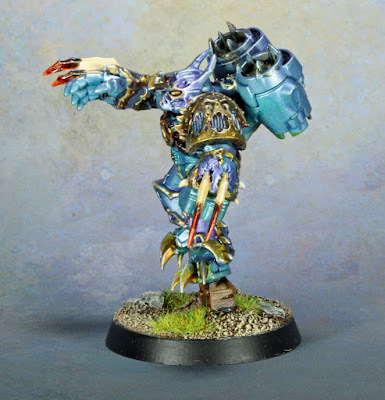 But, Warp Talons are not normal chaos marines. They exist in the warp and have been changed accordingly. So instead of painting these warp spawn with iron armor, I decided to test out the Scale 75 colored metallics I picked up a little while back. My thoughts are that I want them to maintain the metallic armor of the iron warriors but still to look different. Each model in the squad will likely get a different metallic effect as the warp effects everyone differently. As an initial note, I love the Scale 75 metallics. They are the only metallics I have found that can be thinned with water but still retain even dispersant of the metallic flakes. I started by airbrushing the whole model with Amethyst Alchemy. I then sprayed the model from slightly below with Cobalt metal, and then a third shade from almost completely below with Emerald Alchemy. I Applied the darkest color at the highest points and the lightest color at the lowest points to make him look more wrong. The trim was brush painted with Dwarven Gold, Elven Gold, and the Citrine Alchemy. After that, the whole model received several washes. Mostly Druchi Violent and Drakenhof Nightshade. I applied multiple coats until I was mostly happy with the look. I found that the washes really bring out the color in the Scale 75 metallics. After that, it was mostly minor things like cabling and such. Both the eyes and the chaos star were done in yellow in order to pop more against the purple. Finally, I painted the claws like bones as they reminded me of Wolverine's Claws from that phase in the 90's when the adamantium was removed from his body. Lovely stuff Andrew. Bone-claws idea is cool! Beautiful work, Andrew. 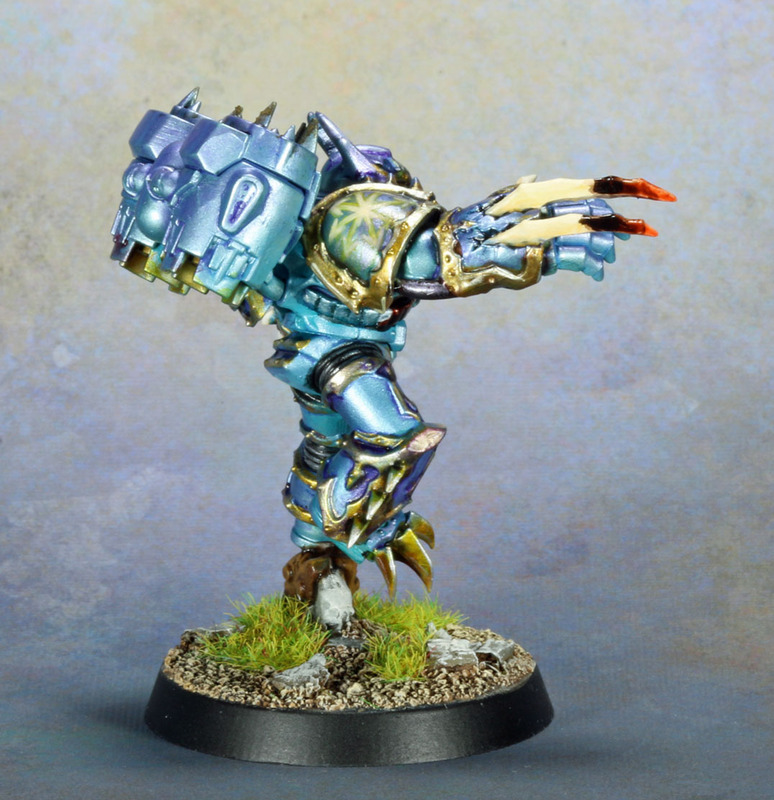 The metallic colour scheme is brilliant (in both senses of the word). I also love the vivid blood on his claws. And thanks for the recommendation about Scale 75 Metallics. I will keep my eye out for them. I can't speak for Canada, but in the USA, you pretty much have to order them from one of a few mail order places.